In my dissertation research, I examine decorated pottery production at San Marcos Pueblo, in the Galisteo Basin of north central New Mexico. 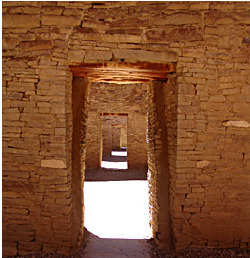 San Marcos Pueblo was occupied from A.D. 1250 until the Pueblo Revolt against the Spanish in 1680. In previous research, San Marcos Pueblo was suggested to be a production center for Northern Rio Grande Glaze Wares (Glaze Ware) (Warren 1976, 1979). I evaluate this claim by examining over 700 pottery sherds and whole vessels from the site and surrounding region. In addition, I examine how pottery production at San Marcos was organized and how this structure changed through time. I examined attributes of the pottery using electron microprobe, petrographic, and attribute analyses to determine local production and degree of standardization of production throughout the occupational sequence at the site. Production specialization, defined as production over the needs of the household (Costin 2001), has been tied to product standardization. Standardization, reduction in variability of an assemblage, has thus been used as an indicator of specialization of ceramic production in archaeological contexts (Benco 1988; Costin 1991; Hagstrum 1985). However, its validity as an indicator of specialized production has been tested only in modern ethnographic contexts and with varying results (e.g., Benco 1988; London 1991; Longacre 1999; Roux 2003; Stark 1995). Within the Northern Rio Grande region of the Southwest, glaze-paint ceramics were produced from A.D. 1315 to 1700. Evidence suggestive of specialization in ceramic production in the Galisteo Basin is found in the glaze-paint ceramics made with latite or monzonite temper (a material found in and along the margins of the Galisteo Basin) occurring in ceramic assemblages from sites outside of the basin (Shepard 1942, 1965; Warren 1969, 1976, 1979). The widespread distribution is indicative of some level of specialized production in the Galisteo Basin, and specifically at San Marcos Pueblo. One important component of the organization of production is intensity, defined as the number of goods produced in a given unit of time (Costin 1991, 2001). High intensity of production is also frequently equated with standardization, assuming that the more time producers spend making pots (the higher the intensity of production), the more standardized their products become (Rice 1992). Previous researchers (Shepard 1942, 1965; Warren 1976, 1979) have argued that Glaze Ware production intensified from approximately A.D. 1400 to 1500, then decreased until the time this pottery was no longer produced. My dissertation research evaluates, first, the extent of production for local use and export at San Marcos, and second, the changes in the level of standardization throughout the production of Glaze Wares at the site. My dissertation results suggest that San Marcos Pueblo potters made more pottery than was used at the site and exported pots to sites throughout the Rio Grande Valley. In addition, the assemblage of pots at San Marcos is over 80% locally made, with the proportion rising to almost 100% during some of the most intense periods of production. These results support earlier suggestions of specialized production of pottery at the site. The findings for standardization are intriguing, as there are almost no changes in the level of standardization through time. These results indicate that the production system was incredibly stable, even with other major changes in the lives of the potters, including Spanish contact and the establishment of a Spanish mission at the site. In addition, my research at San Marcos suggests that there is not a direct relationship between intensity of production and standardization of the assemblage produced, at least at the low level of specialized production practiced at San Marcos.